Holiday wreaths make a great homemade gift and household decoration for the season. Follow these few simple steps and get crafting! Prepare your greenery by trimming the bunches and stems down into smaller pieces. 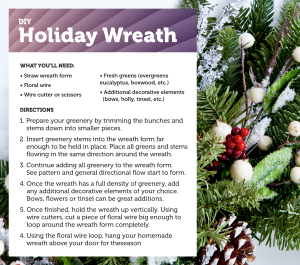 Insert greenery stems into the wreath form far enough to be held in place. Place all leaves and stems flowing in the same direction around the wreath. Continue adding all greenery to the wreath form. See the pattern and general directional flow start to form. Once the wreath has a full density of greenery, add any additional decorative elements of your choice. Bows, flowers or tinsel can be great additions. Once the wreath is finished, hold the wreath up vertically. Using wire cutters, cut a piece of floral wire big enough to loop around the wreath form completely. Using the floral wire loop, hang your homemade wreath above your door for the season!